Premier blue chip John Keells Holdings (JKH) yesterday reported robust results for the first quarter of new 2015/16 financial year, with transportation, consumer foods and retail and financial services sectors driving enhanced value. JKH Group profit before tax (PBT) at Rs. 3.19 billion in the first quarter of the financial year 2015/16 is an increase of 6% over the Rs. 3.02 billion recorded in the previous financial year which included a capital gain of Rs. 389 million. “The increase in PBT for the quarter over the previous year is primarily on account of a 43% increase in operating profits, demonstrating a robust underlying business performance,” JKH Chairman Susantha Ratnayake said in his review to shareholders accompanying interim results. The profit attributable to equity holders at Rs. 2.18 billion reflects an increase of 2% over the Rs. 2.14 billion in the corresponding period of the previous financial year. The revenue at Rs. 21 billion for the period under review is a marginal increase over the Rs. 20.70 billion recorded in the previous financial year. The company P BT for the first quarter of 2015/16 at Rs. 3.25 billion is an increase of 10% over the Rs. 2.96 billion recorded in the corresponding period of 2014/15. 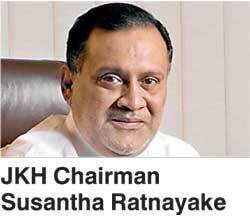 Following is the brief outline of performance of sectors of JKH by Chairman Ratnayake. Transportation: The Transportation industry group PBT of Rs. 590 million in the first quarter of 2015/16 is an increase of 19% over the first quarter of the previous financial year [2014/15 Q1: Rs. 498 million]. The increase in profitability is attributable to the performance of the Group’s Bunkering business which recorded an improvement in margins on the back of an improved local operating environment and the performance of South Asia Gateway Terminals (SAGT), where an encouraging growth in higher yielding domestic TEUs contributed positively towards its profitability. The performance of the Logistics business was in line with expectations as the combined impact of a growth in its active customer base and improved operational efficiencies resulted in an overall improvement in profitability of DHL Keells. Leisure: The Leisure industry group PBT of Rs. 553 million in the first quarter of 2015/16 is a decrease of 16% over the first quarter of the previous financial year [2014/15 Q1: Rs. 659 million]. The decline in PBT is mainly on account of the City Hotel sector, where the Group’s 5 star city hotels recorded a decline in occupancies due to the partial closure of Cinnamon Lakeside. The current slowdown in business related travel into the City, combined with the increased supply of room inventory within Colombo, also negatively impacted occupancies. However, Cinnamon Red continued to perform above expectations with average occupancies exceeding 75% in the period under review. The Sri Lankan and Maldivian Resorts sectors recorded an increase in profitability due to successful yield management and efficiency improvements. The Sri Lankan Resorts also benefitted from the continuing growth in tourist arrivals to the country. Property: The Property industry group PBT of Rs. 203 million in the first quarter of 2015/16 is a decrease of 7% over the first quarter of the previous financial year [2014/15 Q1: Rs.218 million]. The decline in PBT is mainly on account of the lower revenue recognition of the “OnThree20” residential development project which reached completion in the previous financial year. Over 90% of units have been handed over to the buyers with the balance handovers expected to be completed during the ensuing quarter. Construction of the ‘7th Sense’ residential development is nearing completion with all 66 units being reserved as of the end of the first quarter of 2015/16. Waterfront Properties Ltd. finalised a syndicated project development facility amounting to USD 395 million with the Standard Chartered Bank, thus concluding the required debt financing for the ‘Waterfront Project’. Consumer Foods and Retail: The Consumer Foods and Retail industry group PBT of Rs. 880 million in the first quarter of 2015/16 is an increase of 86% over the first quarter of the previous financial year [2014/15 Q1: Rs. 472 million], with both sectors contributing to the improved performance. We are encouraged by the continued strong performance of the industry group amidst growth in consumer spending as well as the fruition of our strategies in the respective sectors. The Frozen Confectionery and Beverage businesses witnessed an increase in profitability driven by double digit volume growth. Keells Food Products recorded a significant increase in profitability on account of enhanced operational efficiencies and higher volumes across all channels. The Retail sector reported a strong performance aided by an increase in footfall which contributed towards a year-on-year growth in same store sales, whilst average basket values remained stable. Financial Services: The Financial Services industry group PBT of Rs. 373 million in the first quarter of 2015/16 is an increase of 12% over the first quarter of the previous financial year [2014/15 Q1: Rs. 332 million]. Nations Trust Bank was the primary contributor to the improved performance. The overall insurance industry benefitted from the increase in disposable incomes with both the Life and General Insurance businesses recording an encouraging growth in gross written premiums. On 28 May, Union Assurance PLC announced that a maximum of 26,785,714 ordinary shares will be repurchased at a price of Rs. 167.80 per share in the proportion of 10 shares for every 32 shares held. The offer closed on 28 July and JKH has accepted the offer to repurchase its entitlement. Information Technology: The Information Technology industry group PBT of Rs. 68 million in the first quarter of 2015/16 is an increase over the first quarter of the previous financial year [2014/15 Q1: Rs. 21 million]. The improved profitability is mainly attributed to the Group’s Business Process Outsourcing operations which benefitted from the growth witnessed across a few large clients and the successful implementation of a number of cost management initiatives. The Office Automation business recorded a growth in volumes across its three main product segments. Other, Including Plantation Services: Other, including Plantation Services and the Corporate Centre recorded a PBT of Rs. 522 million in the first quarter of 2015/16, this being a decrease of 37% over the first quarter of the previous financial year [2014/15 Q1: Rs. 826 million]. The lower PBT is primarily due to the gain of Rs. 389 million arising from the disposal of the investment in Expolanka Holdings PLC included in the last financial year. Revenue and profitability in the Plantations Services sector were negatively impacted as tea prices continued to remain at low levels. Subsequent to receiving shareholder approval on 26 June, the company completed the subdivision of its ordinary shares, whereby seven shares were subdivided into eight shares.